Chaim Yelin, commander of the "Antifascist Struggle Organization" in the Kaunas (Kovno) ghetto. He fell in combat in April 1944. Writer Chaim Yelin, the organizer and leader of the ghetto partisan movement, dreamed of writing a book about the resistance, underground and Kovno ghetto partisans. The proof of that is in the material which he managed to have written during the war. However, only some of that material has survived. Having devoted all his being to the underground movement, Chaim Yelin perished in the fight with the brown plague without making public the Resistance documents, which were at that time written in blood of Kovno ghetto fighters. These lines were written by his brother and his closest friend, who, from the very first days of Kovno ghetto,fought hand in hand with him. The authors of the book aimed to describe the events with utmost precision. They see it as their duty both to the memory of those who were killed, who consciously gave their lives in the fight against the enemy and those who continue their fight for the reconstruction and growth of the new Soviet Russia. May these lines serve as a historical document to the suffering of the Jewish people in the common fight of all Soviet peoples against the enemy of all humanity - German fascists. When at the beginning of August 1944 Kovno was liberated from the fascist invaders, partisan groups entered the city together with Soviet Army detachments. Among them was the group "Pirmin" ("Forward") and parts of the groups "Mirtis Ocupantams" ("Death to the Invaders"), "Vladas Baronas", "Laisvoi Lietuva" ("Free Lithuania") and others. Many Jews, former members of Kovno underground anti-fascist ghetto organisation fought among them. Having returned to their home town, without washing off road dust, with their sub-machine guns over their shoulders, Kovno ghetto partisans crossed the river Neris (Villia) and entered Kovno suburb of Villiampole (Village). The partisans were going there with a heavy heart, where their fathers and sons, husbands and wives, friends and relatives suffered in the grips of the ghetto - all those who failed to make their escape via barbed wire fence and police cordons of the Jewish prison. They faced a terrible picture: the whole ghetto was blown up and burned down. The remains of the burned and charred bodies could be seen everywhere. Smoke was still coming from the ruins of the houses. The bodies of people who resisted the Gestapo, who did not follow the orders of their oppressors, were lying under those ruins. These people resisted German orders and did not let the Germans to transport them to the west. They were prepared to meet death rather than to leave like slaves. And so the partisans walked among the ruins. Could it be true that everything had perished and all life had been turned into ashes? A cowering figure of a man emerged from the ruins of a big block C (Varniu street 32; * now P.Zibertas street). His clothes were torn and soiled in clay and sand, his hands were bleeding. Having seen the Red Army soldiers and the partisans, having heard his mother tongue, this exhausted man came to the manhole which he had recently dug out with his bare hands and shouted, "Jews, you are free!" Thirty four people, one by one, crawled out of the manhole. All were emaciated and painfully pale, even their skin was translucent. They had sunken cheeks, they were screwing up their cheeks because of pain - they had not seen day light for three weeks! When the order to gather for transportation was issued, these people hid in a dug out, six-meter deep shelter. The house above them was blown up. The exit was buried under the ruble. But the hope of the eminent arrival of the Red Army which would bring liberation aroused inhuman efforts and the people withstood everything: the lack of air, thirst, unbearable heat. Thirty four were from here, several dozen - from the ruins of the former ghetto public baths, eighteen escaped from a nearby saw-mill, about twenty were from the ghetto pottery and dozens and dozens of others restored to life; apart from them also those who came out of wells, sewage pipes and other shelters, where they had stayed for more than two weeks - they now acquire freedom. A Lithuanian woman came up, she was leading a Jewish child whom she had been protecting throughout the war. Here was Yuosas Paulavichius. He saved fourteen Jews and three prisoners of war who had escaped from a concentration camp. He met the Soviet Army while holding in his hands a Soviet banner, which he kept in safety throughout the occupation. Maria Leshchinskiene - "a reliable mother" to twenty rescued Jews - was also present at this moving meeting in the ruins of Kovno ghetto. A group of partisans and Red Army guards approached the ruins of a house. Sergeant Boruch Sedak showed a special interest in it. Here, he was told, used to live his family. Boruch went around the building. Under some bricks he found a book. It was a book by Lermontov. The sergeant went through the pages and stopped on one of them, marked with a blue pencil. "It belongs to Gershel! It is my brother Gershel's handwriting!" - he cried out. It was written in Russian, "People! We are locked up like animals here. For seven days we had been hiding from our executioners in the loft without water, in terrible heat. Then we were attacked with grenades and our house was set on fire. We managed to escape into the cellar. A great number of people in the house have already perished. Their only fault was that their origins did not meet with the approval of the racist scum, who have acquired the guise of Hitler fascists. Comrades! Revenge us! There used to be about forty thousand Jews in Kovno. We are only few remaining... People! Annihilate the fascist scum. No mercy! Let them have their just deserts. Let the mankind rid of the worst evil in its history. Comrades! May the sacred revenge become the essence of your life! One of the Jews killed - Ghirsh Sedack.15.7.44." This note is one of the many documents from the ghetto. Several partisans, participants of a militant anti-fascist ghetto organisation, found a blown up cellar. Here, for a long time, were the headquarters of the organization, here they hid weapons and ammunition. From a nearby well they extracted a wooden box. In the box there was a small tin box. Having opened the box the partisans found some of the archives of the Kovno ghetto antifascist organization. These documents were hidden at a critical time, at the beginning of 1944, when they were expecting the ghetto liquidation. The yellowed pages, which were handed from person to person in the ghetto, finally saw the daylight. These pages gave hope, lifted spirits, they helped to organize and to mobilize the fighting ghetto vanguard, who came out armed in order to take vengeance on fascists. Among the found documents, which are now kept in the State archives of the Lithuanian SSR, was the charter of the ghetto antifascist organisation. The first article of it states that the main aim of the organisation is the fight against fascism until the bitter end. A "combat programme" of the movement was also found. Aims, methods and tactics of the fight were also formulated in it. Introduction of the "combat programme", written in the occupied territory, contains information on the origins of the resistance movement in Kovno ghetto. It says, "We were the first ones to experience the German invasion and occupation as we lived in the boarder region. Having attacked the Soviet Union, Germans occupied Lithuania as early as the first week. Storm which is sweeping a country has a terrifying power. Many town and country people, having been accused of sympathizing with the Soviet power, were killed. Tens of thousands of Jews, who tried to escape further into the country, were caught and executed. Hundreds and thousands of Jews were incarcerated in Kovno forts, prisons and synagogues in other Lithuanian towns and villages. From there they were led to an execution point. The dead and wounded were thrown together into prepared pits. Kovno - a former temporary capital of Lithuania - is one of the most important industrial and significant cultural centres of the republic. The city, which is situated in the very spot where the river Neris leads into Neman, was not far from the then border with Germany (80 km). On the 22nd of June 1941 Molotov said in his speech," Today, at 4 a.m. without making their demands to the Soviet Union, without declaring war, German military forces attacked our country, breached the state border in many places and bombed the cities of Zhitomir, Kiev, Sevastopol', Kovno and a number of others." And so Kovno became one of the first cities to suffer from German fascists, who treacherously attacked the Soviet Union. 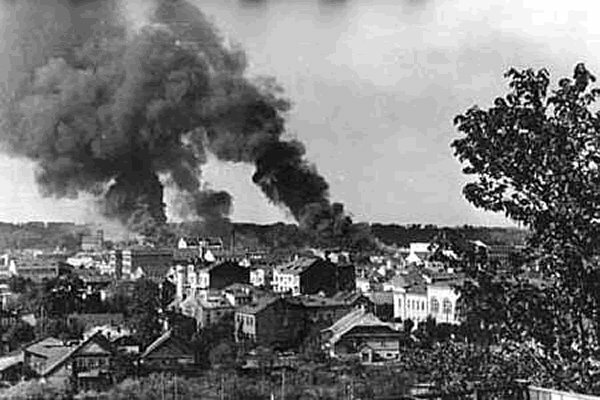 The fascist hordes forced their way into Kovno suburbs as early as the night of the 23rd of June. 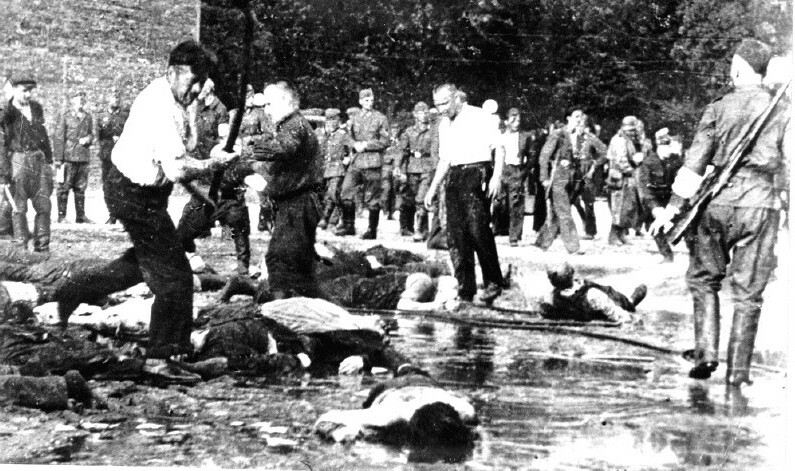 A small group of city residents, having used transport means which were at their disposal, managed to evacuate; but many of those making their way eastward on foot were captured by the attacking fascists. Such a fate befell those Jews who were trying to evacuate further east into the Soviet Union, having left behind their houses and other property. 200 kilometres from Kovno the attacking Germans also caught up with the authors of this book, who were trying to evacuate. Lithuania fell into the clutches of fascist executioners. The invaders attacked Soviet population with savage anger. 1) Jewish population is forbidden to walk along city pavements. Jews must walk on the right edge of a pavement one behind the other. 2) Jews are forbidden to be in places for rest, to use public benches. 3) Jewish population is forbidden to use public transport. Every- where in public transport one should place notices which say: "Jews are not allowed!" 4)Those who break this law will face capital punishment!" Order No.2 compels all Jews, irrespective of their gender or age, wear a star of David, 8-10 centimetre in diameter, on their chests and backs. Jews are allowed to be outdoors only at certain times of the day. They are forbidden to sell, exchange or dispose of in any other manner any of their property. Jews are forbidden to live with non-Jews. The orders were getting tougher and tougher with time going by. Each new order tightened its grip on the Jewish population further... It was forbidden to buy food. Jews were condemned to hunger. On the basis of this order, at the beginning of August, in one day twenty six Jews were shot dead for trying to buy food from farmers. Armed gangs of Lithuanian nationalists, former members of fascist organisations in bourgeois Lithuania - "Shauliu saiunga" (Riflemen), "Yaunoi Lietuva" (Young Lithuania), "Neolietuva" - various scum and criminals got the freedom of action. They began persecution of Soviet activists and families of Soviet Army servicemen, best sons and daughters of Lithuanian people were killed. There were endless arrests of Soviet activists in the city. A great number of people died at the hands of Gestapo: Budjinskiene, deputy of the Supreme Soviet of the USSR, Pranas Zibertas, deputy of the Supreme Soviet of Lithuania, Girsh Sesitskii, Sender Aigulskii and Jeruchim Natanzon, trade union activists, Vitautas Montvila,famous Lithuanian poet, Joseph Witz, Shcherbakov, well-known worker, with his wife and a newborn baby son, and very many others. 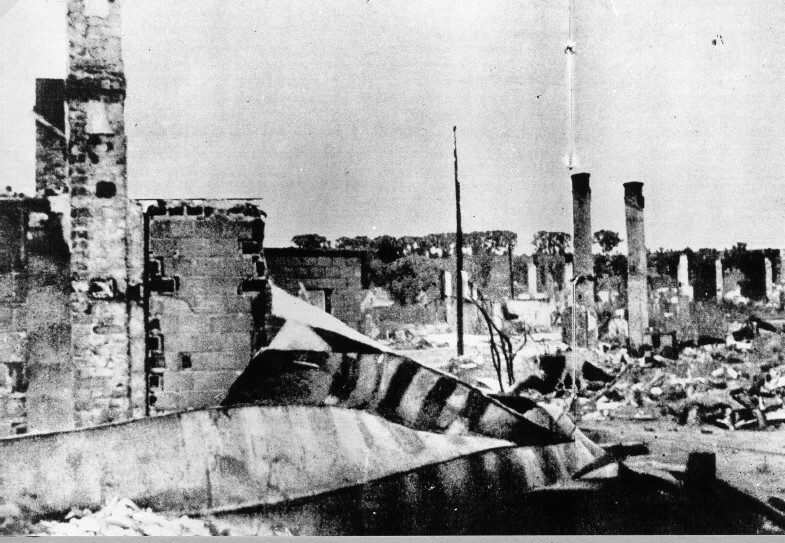 Over 1000 Jews were killed in a most terrible manner on the night of 26th of June in Kovno suburb of Villiampole. Ruthless executioners crashed children's heads with the butts of their guns. A six-year old girl was lying with a broken leg; she was grabbed and her body was hit against a telephone pole, this leg came off the body... Some bandits came across rabbi Salman Ossovskii while he was sitting clad in tallis with his prayer book. Those executioners cut his head off with a saw. They cut off the tongue and put out the eyes of the leader of Villiampole yeshiva Abraham Grodzenskii. The executioners slaughtered whole families living in the streets Paneriu, Vidurine, Jurbako, Arëgalos and others. But even then there were already people who did not give their lives without a struggle. Sarah Soifer saw worker Benzl Fain breaking the skull of the fascist who entered his home first.The executioners attacked the owner of the flat, his wife and his child. Benzl was torn to pieces. The child's head was torn off and thrown out of a window into the street. This severed head was left there for several days. A young Jew by the name of Strazh, an accountant in a Kovno bank, threw himself at one of the marauding bandits and put out his eyes. Blacksmith Shmuel Katz fought against fascists like a lion. But what could one do in the face of all rifles and machine-guns! And yet he fought for his human dignity till his last breath. Blacksmith Jitzik Fridman, a Jewish strongman, came out with an axe to meet thugs from the "New Order". Such cases were numerous. Dead bodies of men and women were found at entrances into houses, in cellars, at entrances to those cellars and sheds, where they defended with axes and truncheons approaches to where their families were hiding. A whole family was massacred in a flat at 10 Arëgalos street. Seriously wounded head of this family, Akiva Pukhert, metal craftsman in Kovno factory "Drobe", managed to write before his death in his own blood on a wall, "Revenge!" his body was found next to this inscription. The hunt for Soviet people continued in the streets of the city. 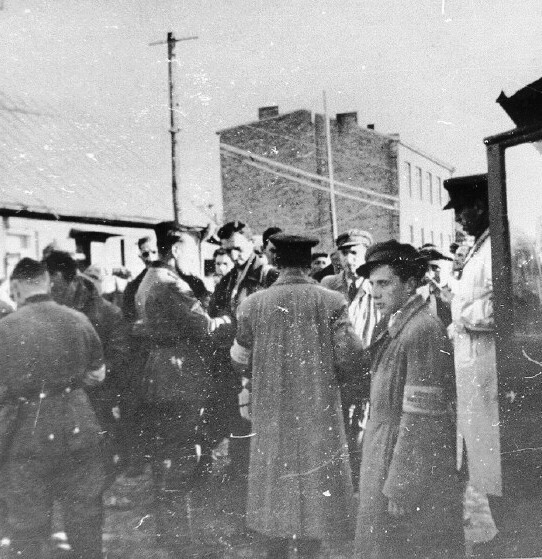 Captured people were delivered to Kovno prison under a strict guard, and later, when the prison became full - to the Seventh Fort ( one of the forts belonging to the former Kovno fortress). At the end of June about eight thousand men, women and children were gathered here. Women and children were kept under lock in underground cells. People were deprived of food and water; they were not allowed out even to relieve themselves. Both dead and living were lying together. The guards constantly robbed the prisoners. If one of them took a liking to some clothing or a pair of boots, the unlucky owner was taken away to the woods and shot dead. A favourite pastime for the guards was shooting people who were kept in the ditch. Not every bullet used to kill a person outright. The wounded moaned, though all were under orders to keep silence and not to move. When one of the wounded would cry out with pain the sound of flying bullets could be heard again until silence would set in. But people managed to resist even in those conditions. Aaron Vilenchuk and Gilel Mariner, who miraculously survived the terrible massacre in the Seventh Fort, remember several cases of people attacking armed guards with their bare hands.Famous Kovno doctor Boris Hodos ignored the order to stay down without moving and got up. He openly told the bloodthirsty animals in human disguise what they really were. "Your day of reckoning will come! "- he shouted at them. Boris Hodor called on his Jewish fellow- prisoners to resist the fascists. A guardsman opened fire and wounded the brave man. He was "allowed" to die in terrible agony. Worker Haim Hendle, teacher Moishe Goldman and many others acted in a similar manner. On the first of July, those men who were still alive were shot dead. The fascists' main aim of killing Jewish old and young men during the first days - to weaken the force of possible resistance - was achieved to some extend. "A group of Jews, a part of which I was, was brought for work into the cellars of a school in Aukshtaichiu,52. All the walls of these cellars were spluttered with blood. Severed hands, feet, individual fingers, bits of human flesh lay everywhere on the floor. We were made to wash walls, pick up and dig into the ground in the yard the human remains. We were "encouraged" by whips." Other Jews were forced to gather one afternoon in the courtyard of a garage at 43 Vitautas Avenue (now it is Lenin Prospect), in the centre of the city. Some of them were killed with shovels, iron bars or by other barbaric methods. Bodies were thrown into a pile. One of the executioners climbed on top of this pile and began playing harmonica. The others, drunk on vodka and at the sight of human blood, sung with him and danced. Among those rushed to witness the terrifying event were German officers with cameras in their hands. The fascist were in a hurry to photograph the harrowing scene. All those events showed the true face of fascism and deeply angered the whole city. Lithuanian doctors Kutorgene, Staugaitis, Alekna, Kairiukshtis, woman-writer Bortkiavichene and others tried to persuade the invaders to stop Jewish pogroms. German leaders warned them against interference in this matter; if they showed compassion for Jews they would finish up sharing their fate. Many Lithuanians took Jews into their flats thus saving them from executioners. Ionaitis, who lived in 16,Iurates street, hid in his house the persecuted during the worst days of massacre in Villiampole. He kept them there for a week and saved them from all dangers. 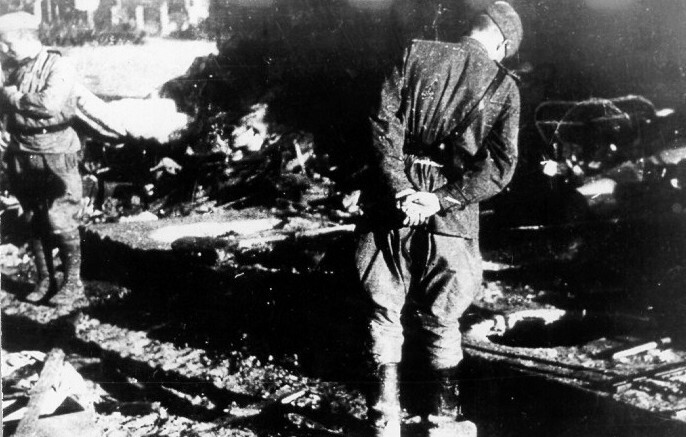 Father and son Boruchovich were near their place of execution by fire at a "shaulist house". Woman-worker Brone Lipskiene, wife of a communist, attacked the fascist who was taking them there. She shouted, "Murderers! Bloody dogs!" Risking her life, Brone Lipskiene, gave the two Jews an opportunity to escape. 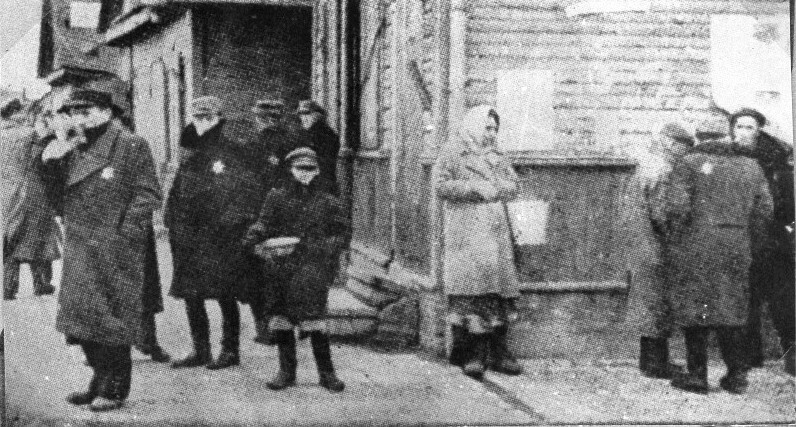 Worker Stasis Iovaisha of Benedictine Nuns street ( now it is Pakalnes street) warned all passing Jews not to go to Villiampole when pogroms took place there. Iovaisha hid many people at his place and kept them hidden all the time while the massacre went on in the town. Lithuanian writer Kasis Binkis' house was turned into a real Jewish refuge. During the days of the gravest danger the persecuted found a shelter here. The Binkis family shared with them their remaining bread and clothing. One can cite many more examples of help given to Jews by Russians, Lithuanians and Poles. This help is a living proof that friendship among various Soviet nationalities found its roots during the first year of the Soviet power in Lithuania. On 10 July a new decree appeared in the streets of Kovno making it compulsory for all Jews to leave the city by 15 July 1941 and to resettle in designated for them quarters of suburb Villiampole. 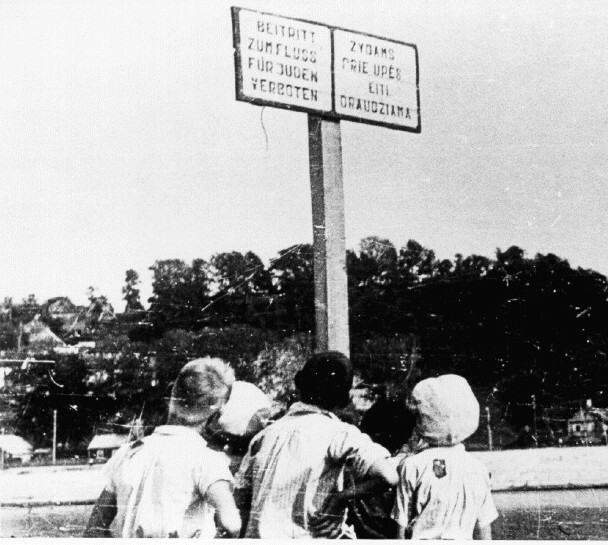 Germans noticed that the "resettlement" was going at a very slow pace while the permitted time for it was running out. 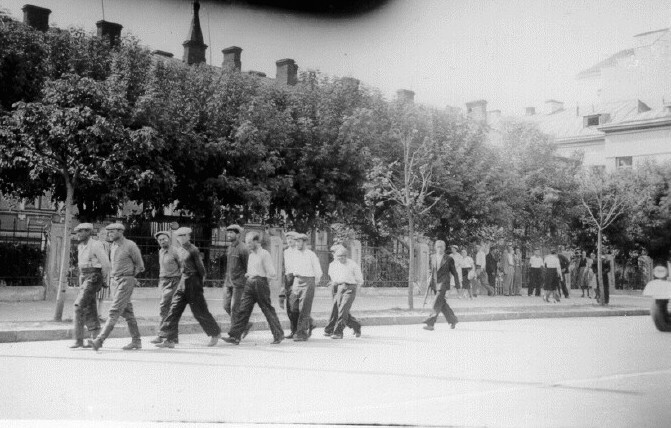 On the 7th of August a massive round up of Jews was carried out in the city. The rounded up were put into trucks and taken away. No information is available about those people. A few hundred men were still kept for a little while in Kovno prison. At times they were taken out for work in the city docks. Later traces of them were also lost. 1,400 Jewish people lost their lives on "black Thursday" - that's how people called that round up. While increasing the terror from day to day Germans drove the Jewish population of Kovno to a specially designated part of the city. Around 33 thousand Jews had to live in the quarters where there used to live 4 thousand people. A so-called "Jewish committee" was set up to oversee the distribution of accommodation, meagre food supplies and to keep some internal order. Former shop keepers, factory owners, representatives of the Church and people from various nationalist parties made up the majority of this "committee". When Kovno ghetto was established officially, Germans named this "committee" "Council of the Jewish Ghetto Elders" ( in the everyday language "Council of Elders"). When taking his office of a "commissioner of Jewish affairs" at Kovno German Commissariat hauptsturmführer SS Fritz Jordan, a short scum and a failed shop owner from a small German town Aitkuny by the Lithuanian border (*now it is village Chernyshevskii in Nester district of Kaliningrad oblast) defined functions of the "Council of Elders" as follows, " You have no right to address me. You must simply listen and carry out my 'orders!" In order to give his orders Fritz Jordan used to arrive at the ghetto "Council of Elders" by car, kick the door open with his boot and burst into the building. Everyone had to leave the room. Only the chairman of the "Council of Elders", seventy-year old doctor from Kovno Hona Elkes was allowed to stay behind; he had to listen to the orders while standing at attention without any movement or a single word. Jordan used to speak with an arrogance of a German sergeant major. He used to work himself up into hysterics, he growled, stumped his feet and hit the table with his fist. The fate of 33 thousand people lay in his hands. "In three weeks time you must hand in all your money, gold, silver and other valuables. You are allowed to leave only ten marks for your family!" "Jews are not allowed to own electrical appliances, musical instruments, sewing machines, bicycles, cameras!" "In two hours time you must deliver to my office two large palm trees and two Persian rugs!" "Horses, cows, goats, and also chickens, pigeons,parrots must be handed over to Germans!" Such orders were issued regularly. Jordan ordered to hand in textiles, suits, fur, leather, furniture, art objects. It goes without saying that if those orders were not fulfilled the offenders could expect only death! Naturally, the gravest of all crimes was hiding weapons. Even Finnish daggers and theatrical props, such as swords, were seen as weapons. People lost their lives for keeping them too. If hidden weapons were found all residents of that house and even of the block faced death penalty. On the 26th of September Germans took over 1,000 people - men, women, children - from the ghetto and shot them in the 9th fort. They were accused of attacking a ghetto warden. From that day the 9th fort had become a mass grave for the Jewish population of Kovno. Pits 120-150 metres in length, three metres in width and two metres in depth lay ready to accept thousand of innocent victims. And not only Jews from Kovno ghetto - Lithuanians, Russians, Poles and also whole wagonfuls of people from Germany, Austria, Czechoslovakia, France and other European countries (mainly of Jewish origin) were killed in the 9th fort. Just in one month, December 1941, fascist murderers killed around ten thousand foreign citizens on the orders of the State Secretary for Foreign Affairs. Kovno residents called the terrifying place of mass murders - the 9th fort - "death fort". Gestapo people felt no shame when they officially designated the 9th fort as "Kovno extermination factory". As by that time selection of people for forced labour had become a norm, that demand did not cause either concern or suspicion. Yet,only few turned up at the gathering point. Hitler bandits set out to gather the required number of people. 534 people were captured. They were led out of the ghetto under heavy guard. No one from that group returned later home... (* It has become known now that they were shot in the 4th fort). Among those "five hundred thirty four" killed people were the leader of the Lithuanian State Opera, violinist Robert Stender, famous film director Marek Martens, who had made a number of Jewish films in Poland, engineers Mordhai Klein and Daniel Goldberg, economists Lion Beliatskin and Shmuel Bloch, artist A.Kaplan, journalist Max Volfovich, sportsman Nojahc Blat, director of Kovno furniture factory Shimon Zimmerman and other representatives of Kovno Jewish intelligentsia. The ghetto was finally fenced off from the rest of the world with the help of high lattice barbed wire and heavy guard. Germans declared territory of two metres on both sides of the barbed wire as a "dead zone". Guards were given an order to shoot without a warning anybody seen in that zone. All chances of meeting non-Jews, buying food from them, receiving medical and other help as well as getting information about the course of war became virtually nil. However,the bravest of people used to come up to both sides of the fence and, having fooled the guards, they exchanged a few words, letters, packages. A sort of exchange trade took place there. Jews gave clothes, household goods and received in exchange bread and potatoes. In the streets adjacent to Kovno ghetto fence one could frequently meet a dainty Lithuanian woman by the name of Bogushiene. Using a suitable moment she passed on bread and vegetables from her kitchen garden to familiar and unfamiliar Jews. Aleksas Miksha technica| shop foreman at rubber factory "Inkaras" - could not forget his former colleagues from work, who lived in dire need. He and his wife frequently came to the fence to pass on necessary things. Not everyone managed to get away from the ghetto fence successfully. Nurse Maria Vaichiene from Kovno city hospital No.1 set out to help persecuted Jews during the occupation. Her son joined her too. But one day the lad was captured and then sent to Germany for forced labour. Nevertheless, the tragic experience did not undermine the spirit of this brave woman - she carried on with her help. Germans shot dead 65-year old doctor Zhakiavichus for helping his colleague - Jewish doctor Matusevich. Nurse Leocadia Shlepetiene, who helped Jewish doctors Braun, Woshchin and others, was imprisoned in a German concentration camp. Bronius Kutka,brought down by a guard's bullet,stayed hanging on the ghetto barbed wire. One can mention many more of similar examples! Naturally, Jewish losses were even greater. A different possibility of contacting the outside world was created in places where Jews were delivered for forced labour. It was virtually impossible to avoid compulsory work if you lived in a ghetto. All ghetto residents of 14 to 65 years old were declared as "able to work". In the mornings Germans stormed into the ghetto. Like hungry animals they searched through the narrow winding streets of the old Villiampole and made people open doors and shutters of small bent wooden houses. Feeling still sleepy and tired, dressed in old rags,Jews dragged their aching bodies in the morning dusk. They went to the collection point at the ghetto gates in Arëgalos street. Here they formed groups which were sent to various places. Counted and formed into ranks of four (later also five), these groups under armed guard were taken to their place of work. 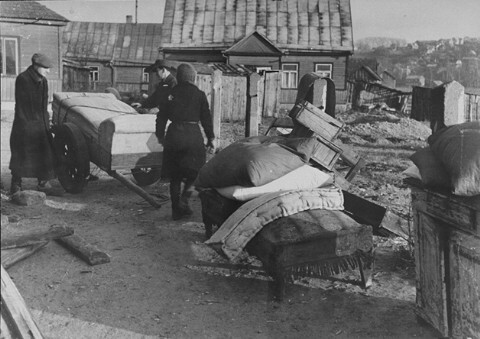 The biggest number of Jews were taken to do heavy manual work at Kovno airfield. Hungry and poorly dressed they dug ground, pushed trolleys, carried stones, bricks, iron in strong winds, severe frosts and heavy rain. Guards armed with rifles and supervisors armed with whips oversaw the work. Nevertheless, the work proceeded slowly and as soon as supervisors left their posts even for a short while, the Jews stopped working altogether. When the Germans returned, the Jews warned each other with a special parole "Yale veiove" (the boss is coming). That meant that they again had to pretend that they were working. This is how the word "Yale" (rising) came into Kovno ghetto Jewish everyday language -symbol of a boss, a manager. And our bodies are aching. Would hardly keep warm us from freezing. Our work is hard and repellent. Why has such a lot fallen to us? Why does the fate treat us severely? The last of all hopes is dying. And final moments are near. Jews were made to go not only to the airfield to perform forced labour, but also to construction sites, transport, timber felling. All types of work performed by Jews were hard and denigrating. Using every available possibility Jews tried to avoid forced labour. However, hunger often made them go there: he, who did not go to work, lost his right to the meagre food "ration", which was at times distributed among ghetto prisoners. But the main reason lay in the fact that work in the city presented them with their only chance to meet non-Jews, to get at least a little food, to hear a word of encouragement. To do this people dared to leave their place of work and to go to the city without their yellow stars. But police lay in wait for them. 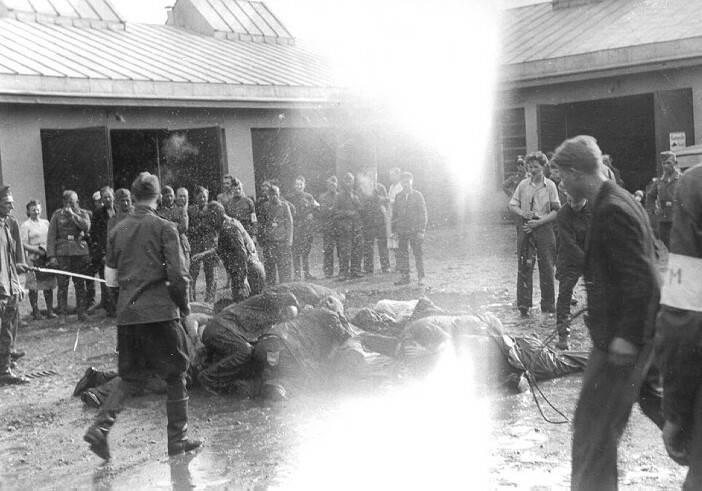 The captured people were shot dead. "The Master of Jewish lives" Jordan personally shot dead on the spot Sholom Rabinovich, who was captured at the market trying to buy a few greens from a peasant. Not a single day passed without a similar incident. Even after people had managed to get some bread or a few potatoes, while risking their lives, there was no guarantee that they would succeed in delivering it to hungry members of their families. On entering the ghetto there was no certainty that one could enter it safely. Often people were deprived here not only of their hard gotten food but also their very lives. Leiser Fisher, Faivl Strashunsky, Meir Zwick were among the first in the long list of names of people killed at the ghetto gates while trying to smuggle food. The ghetto gates were always the most dangerous place there. Often brutal Germans killed people for little reason. They killed if numbers of those sent to work were insufficient or because a guard did not like the way Jews were passing through the gates. They even killed for no reason at all - by shooting into a crowd of people who simply happened to be there. On the evening of 22nd of September one of the guards at the ghetto gates "greeted" with shots a group of people returning from work on the construction of a garage in Kiastutis street. The "occasion" was "Rosh Gashan" (Jewish New Year). Seven Jews were shot dead, one - Klugman, escapee from Warsaw - was buried alive. Germans called their extermination of Jews from the ghetto "action". 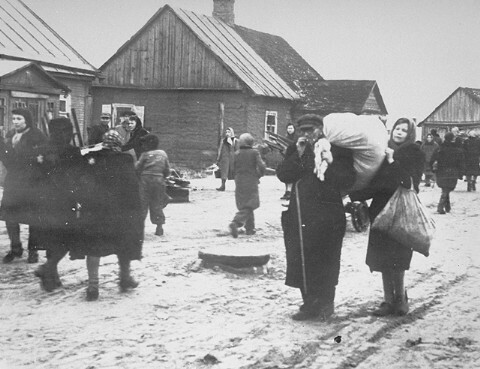 Actions in Kovno ghetto followed one after another. On 4th of October 1941 around 3 thousand people without work permits were arrested in the "little ghetto" ( a separate part of Kovno ghetto). They were sent in large groups to the 9th fort. Residents from an old people's home and orphans from a children's home were sent there by lorries too. During this action ghetto hospital with all the patients and medical staff still in it was burnt down. But in the very depths of the ghetto forces were growing which could see a way out.